I love reading food blogs! I get so many great food ideas as I'm sure you all do too. Recently, Karen posted a recipe using orzo and sun-dried tomatoes and cooked it like a risotto. Now orzo is a small, rice shaped pasta that is wonderful in many different dishes. I've cooked orzo like risotto before for this recipe, and I loved how it turned out. Well, yesterday I needed a quick side dish to go with a rotisserie chicken I purchased at the supermarket for lunch, and I thought of making a quick orzo dish using ingredients that I had on hand. It was delicious and it only takes about 15 minutes to cook. The earthy mushrooms paired with the tangy sun-dried tomatoes is wonderful. Give it a try! Slice onion, garlic, mushrooms and sun-dried tomatoes. Heat the chicken broth in a sauce pan or the micro wave. In a large skillet over medium heat, add the olive oil and the onion. Cook until softened. Add the mushrooms and garlic and stir until mushrooms are cooked. Remove mixture to a bowl. Add the orzo to the skillet and stir until lightly toasted. Add 1 cup of hot broth to the skillet and stir the orzo until the broth is absorbed. Add more broth, 1/2 cup at a time until all the broth has been used and the orzo is cooked al dente, about 15 minutes. Add the mushroom mixture and the sun dried tomatoes back into the skillet with the last addition of chicken broth, along with the parsley. Also stir in the Parmesan cheese. Add salt and pepper if needed. I didn't need to add salt because the Parmesan made it plenty salty for us. Enjoy! NOTE: This also makes an excellent main dish, served with a good salad. I love this and will try. 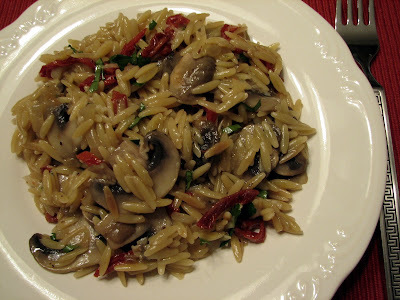 Orzo and sun-dried tomatoes and mushrooms - always a winner. That looks too good for a side dish, believe I'd have it as an entree. ohhhh. I love the addition of the shrooms! 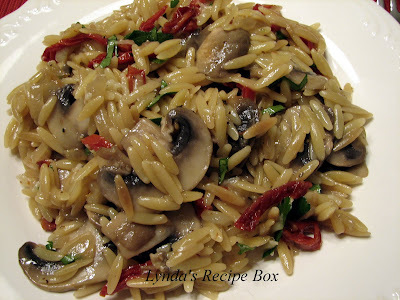 I love orzo, it cooks up so quickly.Pasta, cheese and mushrooms sounds like my kind of dish. Oh my, doesn't that look good?? I love orzo...nobody can believe it's pasta, everyone thinks it's rice! Can't wait to try your recipe. Orzo, mushrooms, sun dried tomatoes and Parmesan are a super combo of ingredients! I love orzo. This looks like a really great combination of flavors! I'm so impressed you just whipped up this yummy dish for lunch! I think I need to step up my lunches. This is such a tasty & fab dish! Yum! I love orzo and I love sun-dried tomatoes. That looks a great dish! I've only had orzo once or twice and I've never made it myself. That needs to change soon, because yours looks really good. I have the Quiche recipe up, thanks again for the idea :). I love orzo and this is definitely a winning combination! This sounds like a terrific side dish, perfect with so many things. I am a huge fan of sun dried tomatoes, and this is an excellent way to use them. Thanks for sharing this, Lynda. It looks deeee-licious! I keep threatening to make a risotto, but I haven't got round to it, as yet. This sounds like a scrummy combination. Anonymous, Thanks for pointing out my omission!Add the tomatoes when you stir the mushrooms into the orzo. I've corrected it in the post;Thanks! And a thanks to you too.